I don't have cats but my sister does and I love these offers from kitty food companies to share with her! This one looks like one that any cat would love. 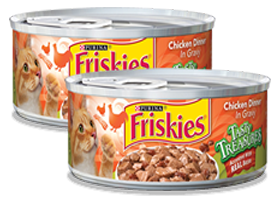 Get a FREE can of Friskies Tasty Treasures Accented with Real Bacon coupon. Simply enter your shipping info on the form and your coupon will be mailed to you within 6-8 weeks. Click HERE for this coupon. Go ahead...give your kitty a treat they will love!